I started to lose my hair in my 20s and, as comedians do, I tried to compensate with humor. I told people that my losing my hair was akin to being higher on the evolutionary chain as eventually we would all be hairless little bald guys like the aliens in Close Encounters of The Third Kind. But the fact is, Darwin got it wrong. 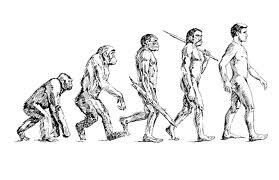 The evolutionary path depicted in the photo above is not true. Because, even though I have all but lost nearly all the hair on my head, it’s popping up everywhere else. The hair on my ears sprouts like a chia pet given sugar water, it’s there before I can see it. And the ones in my nose, yikes, they come sprouting out and duel with my mustache hairs before I can catch them with the nose diggers. I don’t know if that’s the technical term, but let’s face it, that’s the device’s only purpose. And my back. Come on! How in the world can I reach back there and hit that exact spot with a razor blade? It’s just in, from what I can tell, three of four areas. And for some reason, the water pats it down so it doesn’t get removed. I’m very flexible and I can reach the spot, but the little suckers (actually when I remember, they’re already kind of long) can’t decide if they want me to go with the grain or against. It’s a conspiracy. How can I get a girlfriend, who might want to take care of it for me, when I have these little patches that make me look like a Halloween costume where I used too much spirit gum because I wanted to get an authentic Planet of the Apes look and not just buy a costume? The worst thing might be, that I keep catching myself in windows as I walk through Long Beach, and I’m starting to slump. I immediately adjust it, but it has to be a conscious decision. I’m worried. And I’ve been craving bananas.